If you take fitness seriously you probably want a soundtrack, and if you're wearing headphones, wireless is usually better. Even if they're a common sight in the gym, AirPods are not well-suited to exercise — they aren't sweat-proof, they don't have good sound isolation, and they're only as secure as how well they fit in your ears. The Endurance Peak aims to fix all those issues. It's IPX7 waterproof, which should resist not just sweat but rain and a post-workout shower. Springy ear hooks prevent the buds from falling out, and the buds themselves are specifically shaped to shut out ambient noise — handy around machines or when gym speakers are blaring manufactured pop. The product otherwise seems to be relatively barebones by design. It comes with three bundled tip sizes, for example, and there are no built-in EQ functions — you'll have to adjust those settings in whatever app you're using, if that's an option. Another benefit is price, since at $119.95 the Peak is actually cheaper than AirPods and less than half the cost of Apple's upcoming Powerbeats Pro. Something that could be considered a sacrifice is a lack of physical buttons. The Peak does have a touch-sensitive surface on the right bud, but apart from stopping and starting, we've so far found these controls to be unreliable. It's often easier to change tracks or volume from a Watch. Sound quality has proven excellent. A tight fit maximizes bass, as well as the effect of wide frequency response ranging between 16 and 22 kilohertz. Listening to Childish Gambino's "Feels Like Summer," we even caught lyrics that were unintelligible on other earbuds. As usual these days the Peak comes with a charging case. 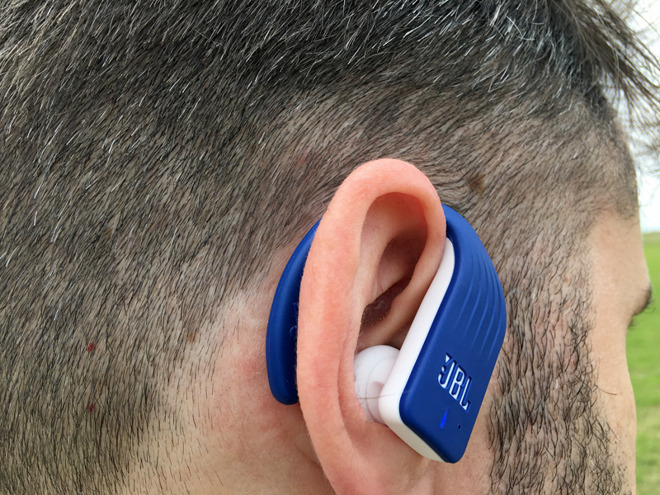 Though the buds themselves last up to 4 hours — an hour less than AirPods — the case adds an extra 24, in theory letting you train a full month before recharging, assuming three 2-hour sessions per week. Keep following AppleInsider for a full review of the Endurance Peak in the near future. 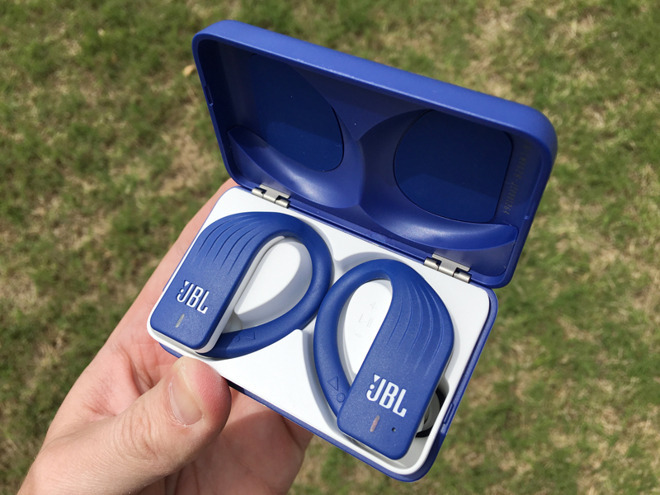 If you want to get your hands on a pair of JBL Endurance Peak earbuds, third-party sellers on Amazon have the wireless earphones in stock for $119.95.